This outfit is nice for work or for going out on the weekend. 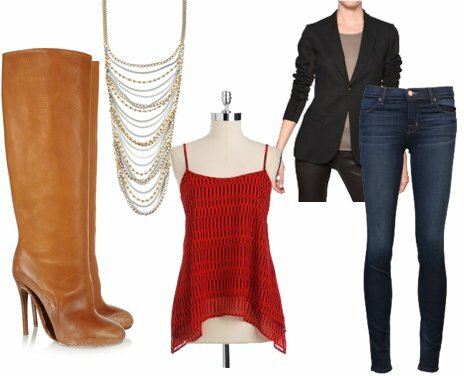 The jeans keep it comfortable and casual, and the chain necklace and blazer add a touch of glamour. Owning a pair of camel colored boots is a great idea, since they are a nice alternative to heels and match with anything. The sweater dress is a Fall fashion staple. The burgundy boots and camel tote are the perfect accessories to complete the look. If weather is cold, wear leggings and layer on a lightweight sweater or aÂ pea coat. This look is pure comfort. A nice option for runningÂ errandsÂ or a relaxed day at home. Don’t you just love the metallic and red glitter Tom’s?! You can still wear that maxi dress you loved in summertime around Fall, simply layer with a sweater and opt for a wedge heel. The gold accessories and black leather tote dress up the look. I saw those Rock & Republic heels at Kohlsthe other day, and fell in LOVE with them. I will definitely be going back to purchase them asap, since they are currently on sale @ $49.99.Â You can use the code UBLOGTEN now through October 24th and stack your savings with oneÂ other department specific code as well. This final look is nice for dressy events or dinners. The blue necklace compliments the orange top so well, and choosing a pencil skirt over pants always fancies up the look. If you’d rather do a dress, choose one in a burgundy shade with a cut similar to the one above; it is designed to enhance and flatter your figure. My favorite thing about Fall fashion is the tall boots, vibrant shades, and cute coats. My favorite outfit is the last one because it is very simple yet classy, and screams Fall- the fact I feel in love with the heels also helped a lot! Do you prefer summertime fashion or are you excited about transitioning into Fall? !